Are you in Luzon and want to buy Cebu Pacific promo fares? Check below updated List of Cebu Pacific sales offices in Luzon. While online booking is the fastest way of getting Cebu Pacific sale tickets, this cannot be done when you don’t have a good internet connection. So, what to do? Buy the promo fares in Cebu Pacific sale offices. 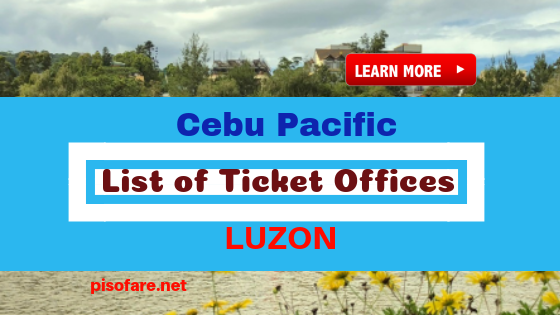 To help you look for accredited travel agencies near you, we shared below Cebu Pacific ticket offices in Luzon. East Asia Ticketing Services Inc.
183 National Highway Brgy., 5 Coron Palawan. Telephone: (048) 725-4425? Another option in availing Cebu Pacific affordable fares is by calling the airline hotline numbers. Read Cebu Pacific Reservation Numbers. Cebu Pacific promo tickets are oftentimes limited in availability; thus, it is best to book or buy sale ticket as soon as a seat sale is announced. Also, once there is an airline promo, read the details including booking period, travel dates and list of destinations. Another important information when booking Cebu Pacific promo fares is how to get the affordable fares. There are times that sale tickets can only be availed via online booking especially during Snap Sales. Check also if you need to input promo code or not. Like and Follow our Facebook: PISO FARE TICKET for more Cebu Pacific promos, Philippine Airlines seat sale, other airline promos, travel tips and info!